At the hour of Divine Office, as soon as the signal is heard, let every one, leaving whatever he had in hand, hasten to the Oratory with all speed, and yet with seriousness, so that no occasion he given for levity. Let nothing, then, be preferred to the Work of God. 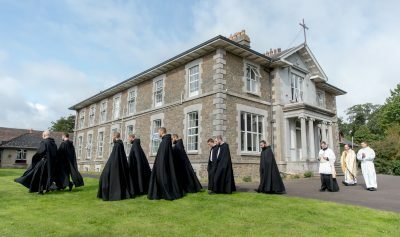 One must, from the very beginning of one’s monastic life, develop the practice of leaving whatever one has in hand to hasten to the Work of God, and this as soon as the signal is heard. In some way, this prompt obedience to the sound of the bell is what confers upon Benedictine life rhythm, order, and alacrity. We are, all of us, tempted at the sound of the bell to attend to “one last thing”. Saint Benedict would have us quit whatever we are doing and betake ourselves speedily to the Oratory, moved by the Holy Ghost to put “The One Thing Necessary” of the Gospel (Luke 10:42) before all else. Prompt obedience to the signal for the Divine Office seems, to the unpracticed in monastic discipline, a relatively easy thing. In fact, it is one of the most difficult habits to acquire. One is always tempted to put off moving until the last possible moment. Foolish men that we are, we think that in so doing we are saving time, or getting more done, or legitimately excused from leaving whatever we have in hand. 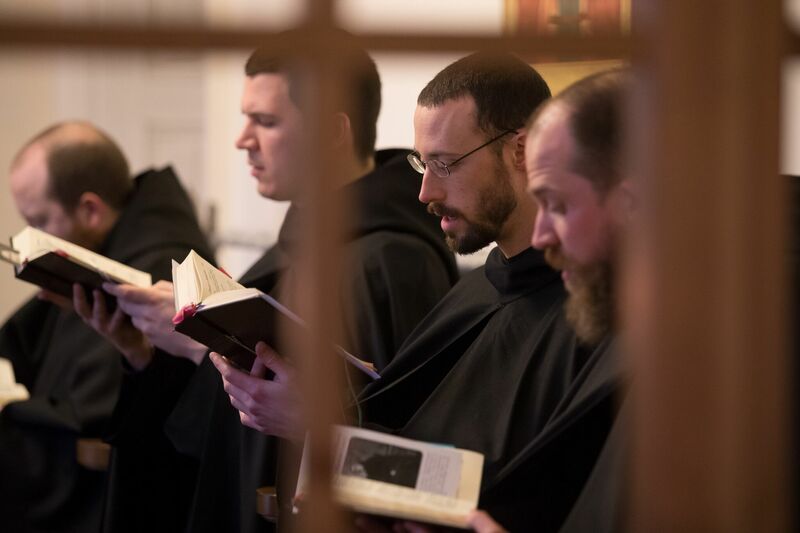 Saint Benedict invites us to be generous in going to God, to surround the times of the Divine Office with space to breathe, with freedom from the cares and troubles for which Our Lord chided Martha. Fundamentally, what is at issue is our trust in the Providence of God. In the first years of this monastery, Our Lord made it clear to me that He would do his part, and do it munificently, if we would do our part by putting Him first. Our Lord gave to me understand that this monastery would be built by hours of adoration. We must give to the term “adoration” its highest and fullest sense: it is the Holy Sacrifice of the Mass, the daily solemn offering of the Lamb, the unbloody immolation of “the pure victim, holy victim, the spotless victim”. It is the Divine Office celebrated with reverence, attention, and beauty. It is the lavish outpouring of time in silent adoration, in a simple abiding in the radiance of Our Lord’s Eucharistic Face, close to the Heart that beats with love so close, so very close to us. I am always moved when I am able to remain in choir after Compline on Thursdays and Fridays: I am aware of the presence of so many of you gathered unto Our Lord, not out of obligation, but out of love, or out of a great poverty that needs to cast itself before Our Lord, or out of a desire to make up by a gratuitous investment of time for every moment squandered, every moment taken from prayer, every impulse of grace ignored in favour of something else, anything else. When I am conscious of us present to Our Lord in this way, it seems to me that He repeats what He has often given me to understand in the past: “For this did I bring you to this place”. The extraordinary thing is that Our Lord uses even the smallest act of reparation on our part to repair us. We may think that we are offering Him something when, in fact, Our Lord seizes upon even our smallest attention paid to Him, and by it, repairs us. This is not a mathematical equation. There is no proportion between our meagre investment of time and the operations by which Our Lord cleanses us, makes us whole, and lifts us up to Himself. Never think, “I have only a minute to give; it is better used doing something else”. Every time a monk lays aside all worldly cares in obedience to the sound of the bell, he opens his soul to the King of All, invisibly escorted by the angelic hosts. The arrival of the King is, more often than not, imperceptible, secret, and silent. He comes all the same, and in coming, He works marvels of love in every soul that opens the door to Him. I can’t read the words of the Cherubic hymn without singing them. God bless you.